Not all that from the sky - from God, not everything that the West - is good. European sociologists scared as old as Europe itself, plague, which is taking new forms. Teenagers and young people in the West began to drink up is not virtual alcohol over the Internet. For a short time online booze got over the hill's enormous popularity. Should we expect a similar trend in us? The poll of 224 x young people aged from 18 to 29 years who have Facebook-accounts, found that social network users do not simply prefer to talk, sitting in front of his home computer, but also jointly drink up alcohol, which is not required leave their cozy nest. You do not need a place to meet, or invite me to visit. At the appointed hour social network members who live in different cities or countries, and maybe in the next house, begin to correspond on Facebook, uncorks a bottle of something krepenkogo and choknuvshis to the monitor screen, drink to the health of his interlocutors. It is not surprising that sociologists consider these practices openly and harmful to the social adaptation of young people in society, and physical well-being of the growing organism. Experts are not fun to joke that the social network's high time to rename the asocial. Most of the participants in such online feasts ruin oneself by drink, gradually degrades in the quiet of alcoholics. They do not beat on Mordasov and do not rush with a knife at his companions, but are quite capable to commit suicide. However, social networking is a positive thing, which is what allows time to establish the relationship of an individual from the Green Serpent and the time to begin treatment. Settle down there like fashion among Russian youth - will show the near future. A new generation of rapidly keeping pace with their foreign peers, which could not be said about their fathers and older brothers, which partly contributed to the famous "Iron Curtain". That small part of the Soviet youth who ape and imitated the habits of Westerners, still adhered to Russian drinking traditions. And this is a serious reason to think that the seed will fall on the west already manured soil. In the Russian tradition, as is sometimes mistakenly think there was no room drinking vodka "on three." This classic of the genre was a social phenomenon that appeared to rising popular among the people drink more costly when the bottle had to buy a purse for the usual price. In January 1958 the price for "mote" (a bottle of vodka with red wax head) rose from 21 rubles 72 kopecks to 25 rubles 20 kopecks, while the "white-" went for 27 rubles 72 kopecks. It was then that there was a joke song about the Soviet leader Nikita Khrushchev: "But the vodka made our way, and forced to drink up three." But in our native traditions have always been taken to drink in the company or team. Even the ancient bowl zazdravnye rusichej called Bratina. Today's "corporative" are descended from the princely retainers pochestnyh feasts, feasts of ancient, medieval guild-binge-drinking. But the ancient bratchiny as feasts were called in Russia, the traditions of pagan ritual meals. And now the master of ceremonies called the chief steward was known as "the elder peers." espite the measures taken by the Party and the Soviet government in the USSR, alcohol consumption per capita every year just increased. In 1960 the consumption was 3.9 liters per person in 1970 - 6.8 liters. The number of Russian drinkers in the current year also breaks all records imaginable. While in previous years, according to the polls, the percentage of drinkers Russian citizens ranged from 22-24%, in 2011, which, incidentally, is not over, of whom there are - 28%. At the same time the most popular alcohol beverage in Russia, the survey, found the beer that they drink 51% of Russians use alcohol. On the second and third place - vodka (31%) and wine (29%). Fans of champagne (10%) outstripped fans cognac and brandy (6%), low alcohol cocktails (4%), and Martini vermouth (3%). 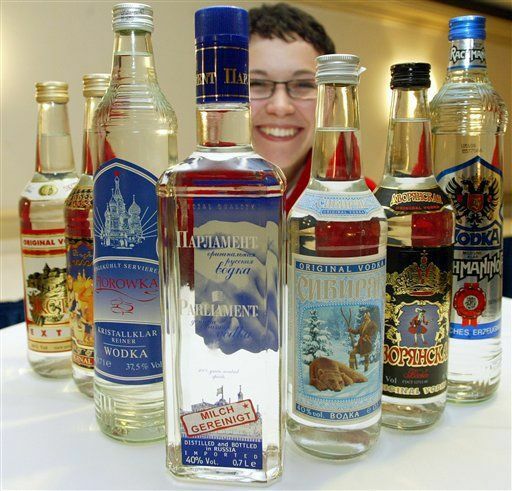 In Russia, small enough fans of liqueurs, whiskey, gin and rum (1%). Could not figure out how much the Russian expanses of people who use absinthe and tequila. Seriously, how little help in the fight against alcoholism made in recent years by the Russian authorities measure. Among them are made at the July 2011 amendments to the law on state regulation of production and turnover of alcoholic products, according to which alcoholic beverages were classified as beer and drinks from it. Before that there were restrictions on beer advertising on television. Most Russian citizens approve of measures to ban the sale of alcohol in areas adjacent to the children, educational and sports facilities (95%), increased penalties for the sale of alcoholic beverages to minors (94%) and a ban on advertising alcohol in products intended for minors . Moreover, these adults continue to give bad example. Russian vodka has long symbolized our country, along with black caviar, ballet, Kalashnikov, and more recently appeared "Russian mafia" and sunk into oblivion - the KGB. Foreigners, who know us not by hearsay, so to speak with insayderovskoy information, it is surprising not so much drunkenness in itself - drinking throughout the U.S. and Europe, and drink a lot of very strong drinks - as a Russian desire to drink as a condition of normal human relations. How this is done in Russian, when before you did not face a drunken-breathing fumes of the individual, but a faint glimmer of companies - one is known to Bacchus!